Note: If you are a member and are not currently receiving our emails, but wish to receive our updates, please contact us to be added to our email list at lakewausau@gmail.com. We've been notified of a proposed regulation change for panfish (i.e., bluegill, crappie, and other sunfish), which is part of a statewide initiative by the DNR (there are approximately 100 lakes in the proposal statewide, including Lake Wausau). The proposal is for a new bag limit of 10 instead of 25 panfish. See DNR slides for details of the proposal provided by Tom Meronek, Fisheries Biologist. Please feel free to contact him directly with any questions you may have at (715) 359-7582 or at thomas.meronek@wisconsin.gov. Development of a Lake Management Plan (LMP) is the final task of the project which is expected to conclude by December 2017. The LMP will provide direction for implementation needed to achieve goals related to water quality and water flows, recreation, shoreland management, fishery management, communication, and water governance. The plan will identify the steps required to achieve these goals and the parties that are responsible for the action steps. Development of the plan will involve a series of planning meetings among the researchers, LWA, and local municipalities. 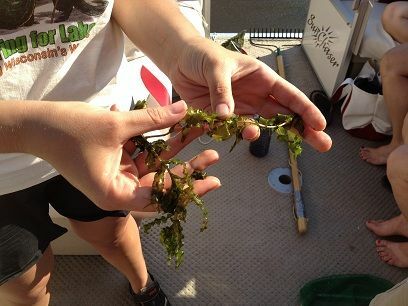 The first planning sessions took place on March 18, 2014 and April 29, 2014 where we reviewed the results of UWSP's aquatic plant survey, discussed areas of the lake that require attention, and discussed options for remediation (i.e., harvesting, chemical treatment, draw down, etc.). We also held a planning meeting on January 22, 2015 to review and discuss the results of the Socio-Economic Survey taken by UWSP Researchers. Final planning meetings will take place in fall 2017 - watch our Calendar of Events for details, which will also be released to the local press. Below are links to presentations and data reports prepared by our researches as a result of their surveys during the evaluation project. Please note many of these reports are draft reports and final versions will be included in our final development plan. Please also take 10 minutes to watch the Wisconsin River Flyover Video that provides a special illustration of the phosphorus levels in the Wisconsin River. This video was provided by the partners at UW-Extension Lakes, Stevens Point. We hope you find it as interesting as we did! Our board of directors, many of our members, and others in the community have dedicated significant hours to accomplish the many tasks at hand related to this project. Our thanks to everyone for their hard work and efforts in staying on task with this project, and also to all our financial supporters and contributors (including many members of the Association and others in our community, as well as our surrounding municipalities including the City of Wausau, Town of Rib Mountain, City of Schofield, Village of Rothschild, and County of Marathon). We are fortunate to have this beautiful lake at the center of our community. LWA recognizes the need to protect, maintain, and enhance the environmental and recreational values of this natural resource. If you also value this precious resource, please consider becoming a member or renewing your membership by returning a Membership Form with annual dues now, or consider a monetary donation to help fund this extensive on-going project (download a Donation Form and return it to the address as shown on the bottom of the form). We are a qualified tax-exempt 501(c)(3) organization and, therefore, your donation is tax-deductible. Get your tax deduction now... a receipt for your donation will be provided for your records. We thank you for your consideration and support!. Read about Lake Tomah, one of the DNR's many success stories. Thankfully our lake conditions are not as severe as Lake Tomah, and while this is just the beginning for Lake Wausau, we're excited about the future outcome and opportunities for a World Class Lake here in our community. On June 7, 2012, LWA held a General Membership Meeting at the Rib Mountain Town Hall to announce details of the Lake Wausau Evaluation Project. Click here to download the presentation given by LWA which outlines the project research tasks and funding. It's a comprehensive study that will be completed in 3 Phases over a 2-3 year time frame. The Project is currently underway and data is being collected by the researchers. 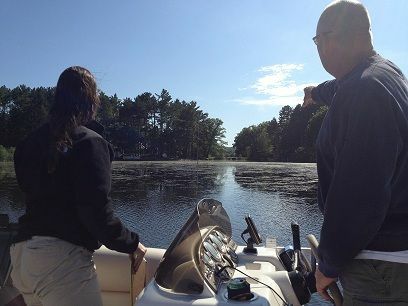 UWSP has been busy surveying the lake this summer. Kristine Koeller, under Dr. Ron Crunkilton at UWSP, started the Bathymetry (Digital Map) surveying in May and will finish surveying this fall. The Lake Map is expected to be available in the spring of 2013. Nancy Turyk of UWSP is focusing on the Aquatic Plant Surveying. 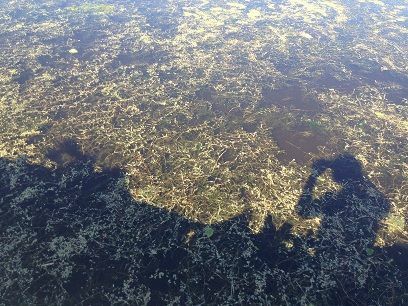 Curly leaf pond weed was surveyed in June and follow up surveys of growing algae blooms and aquatic vegetation were conducted in August. 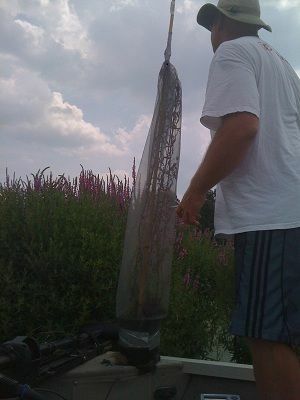 Our thanks go out to Deb Woller for raising purple loosestrife beetles during the spring/summer of 2012. Deb volunteered to raise 7 purple loosestrife plants with beetles which were provided to LWA by Golden Sands Resource Conservation & Development Council (Golden Sands RC&D). The beetles were deposited on purple loosestrife plants in various places on the lake in mid-July. If you are interested in helping us raise purple loosestrife beetles next year, please call Holly or Rick at 715.359.4682 , or email us. The plants are raised in a small pool and require full sun and plenty of watering. Plants are delivered in early to mid-May, beetles are delivered in early to mid-June, and are collected in early to mid-July. These beetles are extremely effective for eradicating purple loosestrife which is an abundant invasive species on Lake Wausau again. 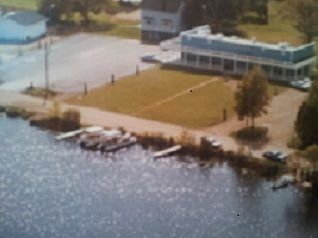 In April 2012, the DNR announced our Lake Planning Grant application, submitted in February 2012, was successful. LWA has been awarded federal funds in the amount of $65,000 and state DNR grant funds in the amount of $25,000 to begin the Lake Wausau Evaluation Project, which has been in the planning stage since early 2011. With the awarded grant funds and the financial support of many community members, as well as the partnership created with our surrounding municipalities (including the City of Wausau, Town of Rib Mountain, City of Schofield, Village of Rothschild, and County of Marathon), we can begin to examine the condition of our lake. The project is an estimated three year study that will focus on water quality, fisheries habitat, aquatic plant management, shoreland habitat, water flows/movement, community values, recreational use, and creation of a digital map of the lake. Upon completion of the study project we will implement remedial recommendations resulting from the study. This is an on-going long-term project that will provide significant improvements to current lake conditions and recreational use, enabling us to protect and maintain the lake going forward so users can enjoy a healthy lake for years to come. As the project progresses, we will hold public meetings to inform community members of status, findings, and the direction of the project. In October 2012, LWA was award its second grant from the Wisconsin DNR in the amount of $25,000 to fund evaluation of the Lake Management Development project. The evaluation will be conducted in three phases over a period of 3 years beginning in 2012. The second grant was awarded for Phase II of the project and another grant will be applied for on February 1, 2013 for Phase III of the project (the final Phase) in the amount of $16,500. To date, we've received $50,000 in WI DNR grants, $65,000 in Federal grants, $26,500 in municipal contribution commitments, and $4,400 in member donations (for a total of $145,900 toward the total cost of the evaluation of $166,000). Phase I of the evaluation project is nearly complete and we are beginning Phase II. 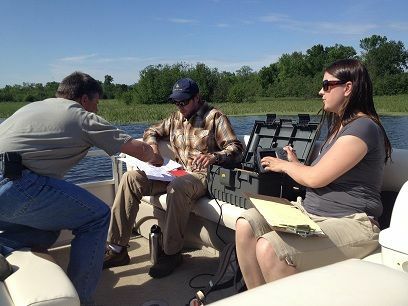 The aquatic plant and map surveying were completed this past summer and fall by our researchers at UW Stevens Point (these portions of the project also lay the foundation for Phases II and III). The map layout is in process and our goal is to have maps available for the community by mid-April. The socio-economic study (part of Phase II) is just beginning and will involve oral history interviews of citizens who have a history of information to share about their experiences with/on Lake Wausau. This information will be recorded and archived for reference and use in creating our developmental plan (which is the final task in the evaluation project). We are seeking interview candidates, as well as interviewers. If you or someone you know is interested, please contact us by email or call Holly Kohl at 715.551.9550 . The U.S. Army Corp of Engineers will conduct the hydrodynamic modeling and dye trace studies beginning this spring (part of Phases II and III). This will be conducted in critical areas of the side channels and backwaters to analyze water flow/movement and assess stagnant conditions and poor water quality. The shoreland habitat surveying (part of Phase II) will also take place this coming summer. All 74 miles of the shoreland will be evaluated and recorded (mapped) so changes can be monitored over time and areas of deterioration can be addressed and resolved where necessary. The final task of developing a lake management plan is expected to conclude the evaluation in the summer/fall of 2014 (Phase III). The plan will be developed during a series of public forums with the assistance from researchers, technical staff, and our local municipalities. This will layout the groundwork for the remediation phase. In April 2013, LWA was award its third lake planning grant from the Wisconsin DNR in the amount of $25,000 to fund evaluation of the Lake Management Development project. The evaluation will be conducted in three phases over a period of 3 years beginning in 2012. The third grant was awarded for Phase III of the project in the amount of $16,500. To date, we've received $65,500 in WI DNR grants, $65,000 in Federal grants, $26,500 in municipal contribution commitments, and $4,400 in member donations (for a total of $161,400 toward the total cost of the evaluation of $166,000). There's been continued delay in completion of the evaluation project and development of our lake management plan caused by the availability of researchers and limitations on federal grant funding relative to the hydrodynamic modeling phase of our project by the U.S. Army Corps of Engineers. Accordingly, LWA has been granted extension for completion of the evaluation project through December 2017. The delays in this work have resulted in the need to obtain another aquatic plant survey and species mapping which was last conducted in 2012 (this survey must be done every 5 years), for purposes of obtaining sufficient and current data to complete the project and to continue conducting weed harvesting. LWA board members worked with the WI DNR to obtain grant funding for this additional study. In April 2017, LWA was awarded a fourth lake planning grant from the WI DNR in the amount of $18,014 for the required aquatic plant survey and species mapping. This work is expected to cost approximately $26,900 and will be conducted in the summer of 2017 with completion by August. "The Lake Wausau Association represents all recreational lake users including kayakers, hunters, skiers, fisherman, boaters, and trappers. Based on facts given to Domtar Corporation by the US Fish and Wildlife Service and the WI DNR, we feel it is in the best interst of the lake to move forward with the dam repairs on September 12, 2016."